"Your ticket to staying motivated and inspired to release the greatness inside you..."
"Introducing a Tool Guaranteed to Lead you Down a New and Exciting Path To Personal Success"
You're busy and I respect your time. I'll let you read what others have to say about it, let you look through the table of contents below (even listen to a few clips from it) listing what you'll learn from having it in your success library, and ultimately let you decide for yourself. My friend, I'm confident that after you have done so you'll want to invest in yourself and make the decision to own a copy of this motivational success package so that you can benefit from having it with you at all times. Remember, you will receive both the Audio Program version (in MP3 format, read by me, Speaker and Author, Josh Hinds) as well as the eBook version (in PDF Format) of "Why Perfect Timing is a Myth". That's a valid question of course. The answer can be found in learning more about who I am, and in my sharing with you an absolutely critical lesson I've learned through my studies and teaching in the areas of personal development and human potential. I first got started in the online motivation and personal development industry back in 1996 when I founded what began as a hobby web site (In case you're curious it's gone on to become the GetMotivation.com web site). Yes, I have been online building a business, and earning a living longer than most people. Long before that, at 15 years of age to be exact I became a student of personal development, business and success thinking when I read my first "motivational book" by author and speaker Zig Ziglar (if you're curious, the book is titled "Over The Top"). Around the same time I was also introduced to entrepreneurship, and in particular sales when at the ripe old age of 15 years young I accepted a make shift position that my father created for me in our families start up business at the time. The position you ask? It wasn't glamorous, I did telephone sales, setting appointments and qualifying prospects, then handing over the appointments to the older sales people (in most cases since we were just getting started, my father). It's safe to say that I've been an entrepreneur most all of my life. Please don't misunderstand, I'm not telling you about myself to brag. I do however, believe it's important you know about me so that you can make an informed decision as to whether or not what I have to share here is worth your time. Am I someone who is worthy of your valuable time or not? That is the question isn't it? With no shortage of people out there willing to shout their expertise from the rooftops I'll spare you of that, and instead allow you to read on and decide for yourself. Most Folks Don't Need Any More "Instruction or How-To"... What They Need is a solid tool that will Inspire and Motivate Them to Actually Make Use Of and Apply All That They've Already Learned! A solid tool that will help them remain focused and inspired on their given path. That's exactly what my program Why Perfect Timing is a Myth does. It's as though you have me, as your personal coach to tap into and listen to whenever you find yourself losing focus, or interest and not doing those tasks which you know you MUST do in order to get to where you want to be. To the place you want your life to look like. To the level of personal & professional success you long for. The Why Perfect Timing is a Myth Success Package will be your guide along the path that will lead to your dreams. As you listen the ideas will inspire and re energize you to go for, take the necessary steps, and ultimately achieve your perfect life! It's not to say that all the programs you've already invested in aren't valuable -- of course they are! The difference you'll experience with my Why Perfect Timing is a Myth program is that as you listen to it, the ideas will motivate and inspire you to actually put to use in a concentrated and ongoing basis all the other programs and ideas you've already learned to date. In Why Perfect Timing is a Myth you will of course find that the messages included in it are powerfully informative too. But it's not just about what you should do, and shouldn't do. You'll find a strong focus on inspiration and it will inspire you to take the necessary actions that will allow you to accomplish whatever you deem most worthy. The program goes beyond simply motivating you -- it allows you to tap into your own personal power by finding what inspires you -- and with each listen it will be as if you have me as your coach right by your side sharing powerful messages of hope, encouragement, and inspiration as you move confidently in the direction of your goals and dreams! "Josh Hinds' 'Why Perfect Timing is a Myth: Tips for Staying Inspired and Motivated Day in and Day out!' is a gem. Apply its principles and you will create a magnificent life!" Author, Speaker, Co-star of the movie "Pass It On"
"Congratulations, Josh! Succinct, to the point, and packed with very valuable information. I could listen to any one of the messages in it and it would contain information that I know would help me. You continue to be the master of motivation and personal development, my friend. Way to go!" Author of, "Endless Referrals: Network Your Everyday Contacts into Sales", Co-author of, "The Go-Giver" and "Go-Givers Sell More"
"Josh Hinds has put together a marvelous collection of essays that are sure to lift your spirits and improve your bottom line. I know first-hand that Josh has used these very same principles to create his own success. This stuff works if you apply it!" "Wow! In Why Perfect Timing is a Myth, Josh Hinds puts together the key ingredients you need to create the life you want. You should get it now for yourself first then everyone you really care about." "Josh Hinds' 'Why Perfect Timing is a myth,' shows each listener how to create a blue-print suited to their aspirations, that will position them to improve their lives drastically, one day at a time." "Real-life, practical ideas that will help you achieve your dreams and keep you motivated during the process." Author of "The Secrets of Power Selling" and "Stop, Ask & Listen". 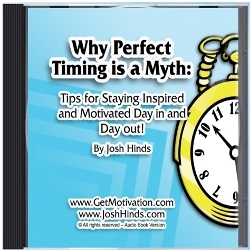 "In Josh's Why Perfect Timing is a Myth he shares proven tips and techniques that will help you stay inspired and motivated every day. Josh has pulled together some of the most powerful success tools available and has demonstrated through great personal examples and examples of others how these concepts can and do work. The information Josh has shared in this is simple and powerful. They are life changing. I know, I have applied many of the principles Josh shares and I have experienced first hand that they work. Do yourself a favor, listen and apply the concepts in this amazing audio program. Your life will never be the same." "Josh Hinds does it again! Why Perfect Timing is a Myth: Tips for Staying Inspired and Motivated Day in and Day out, is filled with easy-to implement ideas to keep you focused on your future success. Don't miss the chance to learn from a PRO." "G.K. Chesterton told us that people need to be reminded much more than they need to be instructed, and that's what this little book of wisdom from Josh Hinds will do for you. Expressed in the highly relatable writing that Josh has always been known for, it's the perfect pick me up when you hit a bump in the road." "In Why Perfect Timing is a Myth, Josh Hinds gives you the best in down-to-earth, highly practical yet powerful advice on how to stay inspired, motivated, and on the road to success! Great stuff!" In my speaking and training I often say, personal development is a hands on project. What that means is that you have to be the biggest part in your own development, be it personal, professional, or a combination of both. So wouldn't it be nice to have a handy guide that you can keep nearby and listen to day in and day out as you move along the path of your personal success journey? That's the exact reason I decided to create this Audio Program version of my booklet, 'Why Perfect Timing is a Myth' -- so that the inspiration and motivation you need to succeed in your chosen endeavors is always close at hand -- whenever you need it. While it is true we can't always control the events that happen to us in life, we can always control the way we react to them. This can be a hard pill to swallow for some folks, but doing so opens us up to the reality that come what may, we can take an active part in creating whatever ideal life we choose for ourselves. After you've invested in this motivational Audio Program and eBook Success Package make a point to keep it nearby at all times and reflect on the ideas in it throughout your day. Look for ways to apply what you read and listen to into your own life. You'll be better for it. It's your life, LIVE BIG! Note: You can hear some of the messages by clicking the blue player button next to its title. * How Do You Measure Success? * Do You See the Positive Side of Things? * It Doesn't Always Take Money Honey! Your investment in all of this is just $21 (regularly $29.95), about the cost of two pizzas. And yet, this small sum of money could very well mean huge results for you in the form of new motivation for going after what you were truly meant to do in your life. Imagine how that would feel. Now give yourself the treat of having this audio program on your desk every moment of the day. Plus, your happiness is guaranteed! If for any reason you decide that these audios aren't for you, just let me know and I will cheerfully refund your money. Complete Your RISK FREE Order Today. If you're not completely satisfied, let us know within 60 days of your order and we'll refund your money no questions asked! PS - Consider this... Just $21.00 (regularly $29.95) for proven inspiring and motivational advice you can use to change your life, it's an awfully big bargain when you consider the positive results you'll have as a result of the ideas contained in this audio program (and the ebook version so you can easily follow along with what you are learning) don't you agree? Don't delay, order using the "Add to Cart" button above.